Despite the introduction of some impressive smartphones in the past year it appears that the market is showing signs of contracting in the US. 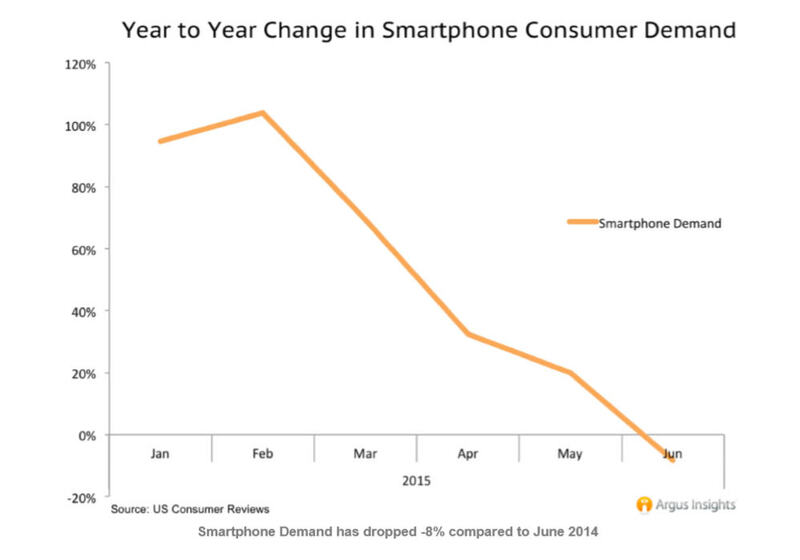 According to a new report from Argus Insights, following a strong holiday season, US smartphone demand in Q2 (ending June 30 2015) dropped steadily and is down 8 percent compared to June 2014. While Samsung and Apple remain the top smartphone brands, Samsung appears to have failed to woo consumers with its two new flagship devices, the Samsung Galaxy S6 and S6 Edge. Argus Insights measures mindshare, which predicts demand. What that means is the company uses curated analysis of global consumer reviews and social media conversations to reveal what is "delighting" and "disappointing" the market. Instead of viewing shipments, it used data compiled from approximately 622,000 consumer reviews since January 2014 to work out levels of interest, and therefore demand. While the launch of the Galaxy S6 and S6 Edge in April mildly boosted consumer mindshare in Samsung, it came at a time when overall consumer interest was falling, and so failed to increase demand. Apple was the only major smartphone manufacturer to post mindshare gains in Q2 according to Argus Insights, with high levels of interest in all of its mobile devices, including the aging iPhone 5. While Apple and Samsung were ranked among the most "delightful" smartphone manufacturers, Microsoft saw an increase in delight from the few consumers reviewing its Lumia 640 and Lumia 535 handsets, which actually made Microsoft "the most delightful" of the quarter, even if actual sales were far from stellar. "This last quarter showed a very dramatic decline in consumer interest in the available smartphones in the US, and even the latest Samsung flagship phones barely made a difference in overall excitement,” said John Feland, CEO and founder, Argus Insights. “In fact, iPhone 6 demand, as measured by consumer review analysis, jumped when customers waiting to purchase and apparently open to buying a Samsung, instead chose an Apple iPhone. Even the early launch of the Note 5 is unlikely to take share away from Apple unless Samsung delivers more than just upgraded hardware. It seems at this point, with such a flagging in consumer interest, that perhaps the smartphone market has hit a saturation point".